Idris and Her Thief. Belt, chainmaille and beads. Main spiral This Is Not Food weave, large links ID=11.2mm, WD=1.4mm, AR=8 brass (gold, silver, plated) small links rubber ID=2.8mm, WD=1mm, AR=2.8 (clear, white); outside beads, eyepins, linked with small rings (ID=3.6, WD=1.2 AR=3) (brass: silver, gold, plated) and those rings linked to the large rings of the spiral weave with medium-sized rings (ID=5.6mm WD=1.2mm AR=4.67, brass, gold and silver plated); some beads not on eyepins but on rings and those rings linked to each other and the main spiral with small rings. 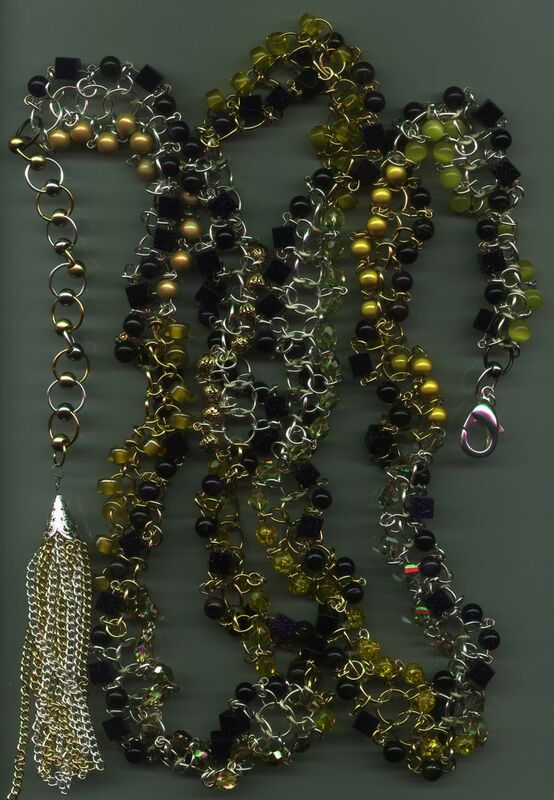 Section at end, Beadlock Spiral 2 in 1 weave, with large links as above, and the beads are brass and nickel pony beads. Main beads: blue on one side, yellow on the other side; blue beads are a) blue goldstone cube 8mm, b) blue goldstone round 8mm, c) blue tigereye 8mm; yellow beads are all 8mm diameter, and are a) round catseye, b) round Mysterious dark yellow, c) golden shadow helix, d) round cracked glass e) jonqquil Czech fire-polished round, f) yellow pony, g) round gold filigree, h) yellow Czech fire-polished round, i) apollo gold Czech fire-polished round, j) lustred yellow pony, k) round Mysterious light yellow. There are eleven sections of yellow bead, and each section has eleven beads.